Wireless dog containment, activity tracking and training system in one unit. 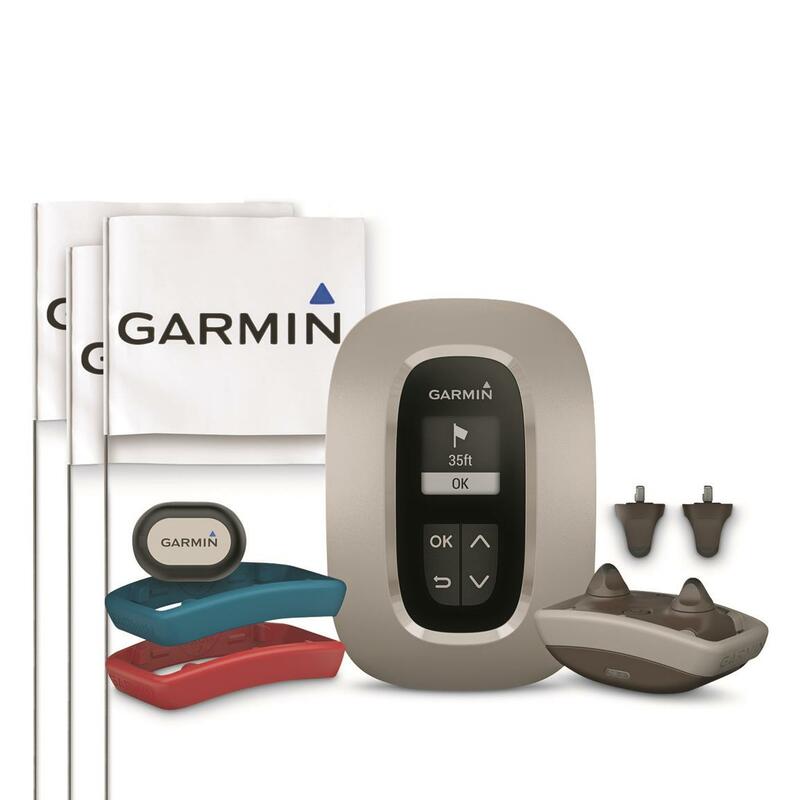 Anywhere you go, you can set safe boundaries for your dogs with the Garmin® Delta InboundsTM System. Delta Inbounds keeps your dog safe in a new kind of way. 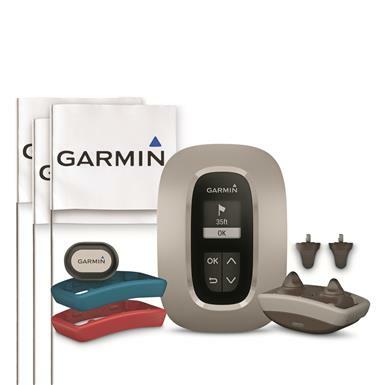 The system combines Garmin on-collar technology with a lightweight, fully portable base station. Contain up to two dogs within a configurable roaming area that spans up to a 2-acre radius. Plus, the included boundary flags provide a visual cue of the geofenced zone, so Fido also "sees" the boundary. And if your dog should breach the boundary area, use the "welcome return" feature to let your dog re-enter without correction. Bundle includes wireless dog containment, activity tracking and training system with small, portable base unit and rechargeable on-collar device. This rugged dog device snaps easily to any collar up to 1" wide (not included). Plastic contacts, available in long and short sizes, function with various coat lengths. The device is built strong and ready to withstand all the bumps, shakes and scrapes from an active dog. Plus, the device and base unit are both water-rated to 1 ATM. A built-in high-intensity LED beacon lets you see it at night should your ambitious pet friend decide to bust out of the containment boundaries after dark. Set up the Garmin Canine mobile app with a compatible smartphone and you can also use the unit as a remote handheld trainer. Reinforce the behaviors you want—and discourage the ones you don’t. Simply press a key on the app’s training display to gently correct your dog with vibration, tone alert or safe stimulation. Delta Inbounds also features industry-leading BarkLimiterTM bark correction technology with settable levels for training your pet to minimize barking. Since the technology detects bark signals through vibrations from the dog’s throat, there's no false corrections caused by other dogs within the area. And for that dog that loves rummaging through that messy trash can, flower bed, or other “no-go” area, use the Keep Away Tag. The Tag creates a 1-3 ft. geofence around alert zones where you don't want your dog to roam. Dimensions: 3.1" x 4.6" x 1.3"
Dimensions (WxHxD): 2.8" x 1.4" x 1.4"
Dimensions, WxHxD: 1.4" x 1.0" x 0.4"